Fill baby food jars half full of whipping cream and screw the lids on tightly. Let kids take turns shaking each jar. After about 5 minutes the cream will be whipped, and after another min or so, lumps of yellow butter will form. Rinse off the liquid whey and add a little salt, if desired. Then spread on crackers to taste! These are cute and easy to make. Spread frosting on cracker. Peel the paper off the kiss and place kiss near the bottom of the cracker. add candy corn above the kiss to make feathers; place one corn on the kiss for the head. Let frosting dry. Attach a caramel to the back with more frosting to make it stand up. Put a small dab of frosting in a bugle. Put several trix in each “cornucopia”. ( I use this for the 3 year old gathering) Insert toothpicks into the bottom of a red apple to form legs. Insert another toothpick on the top of the apple (to one side), and push on a large marshmallow. On 4 more toothpicks, push colored gumdrops. Push these into the back of the apple for feathers. Add raisins and red gumdrop sliver to complete face. I use the heavy duty colored toothpicks to prevent breaking, or not spotting when eating. You now have a Thanksgiving turkey that doubles as centerpiece and a snack! Open one Oreo and place one part, icing side up (eat the other half). Add a bit of icing as glue, and stand another Oreo up on it (this is your turkey body). Spread one side half of the standing Oreo w/ icing, and attach 5-6 pieces of candy corn….fanned out like turkey feathers. Add a malted milk ball to the top of the other side, for head. An additional piece of candy corn can be used for a waddle (or a red m&m). Add candy pumpkins for effect….and create your own little turkey farm! Each Thanksgiving families prepare their own traditional meal. These meals have been passed down from generation to generation, and with maybe a few new recipes sitting on the table, the core of the meal remains the same. The dishes are as varied as the families they have originated from but a turkey is part of just about everyone’s holiday feast. But again, just as varied are the side dishes, so is the stuffing found in a roasted bird. 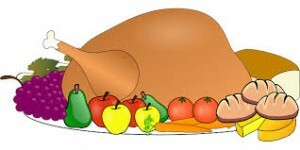 Perhaps you are partial to a bread stuffing, or a meat stuffing, or a fruit stuffing. Whatever your preference there are a few universal healthy cooking guidelines to follow in preparing your stuffed turkey for your family’s well being. * A stuffed turkey takes longer to cook than an unstuffed one. * Never stuff a turkey until just before you are ready to place it in the oven. By stuffing it too early, bacteria is invited to take hold. * Placing a roasting bag, or even better a cheesecloth bag inside the turkey cavity to hold the stuffing makes for easy removal of the stuffing when cooking is complete. * Always stuff the turkey loosely. Compact stuffing will produce clumpy stuffing. * Close the opening with either kitchen twine and poultry needle or with poultry skewers. * Make sure the stuffing cooks to at least 165 degrees. * Never store a turkey with stuffing still inside. Again, you would be inviting bacteria to grow. Heat 1/2 cup water in a large pot or skillet. Add the onion and cook 5 minutes. Add the sliced mushrooms & celery and cook over medium heat, stirring occasionally, until the mushrooms begin to brown, about 5 minutes. Stir in bread & spices, salt & pepper. Lower the heat & continue cooking for 3 minutes, then stir in the water or stock, a little at a time, until the dressing obtains the desired moistness. Spread in an oil-sprayed baking dish, cover & bake for 20 minutes. Remove the cover and bake 10 more minutes. Melt butter in skillet. Add onion and celery and sauté until tender. Stir in mushrooms and parsley. Combine seasonings and sprinkle over bread cubes. Add eggs, bouillon and onion mixture. Toss thoroughly until well combined. Spoon lightly into slow cooker. Cover and set on high for 1 hour, then reduce to low and cook for 1 to 2 hours. 22 bread slices (24 ounce loaf) cubed and toasted for 15 minutes in a 300 oven equals 12 cups toasted bread cubes. Source: Butterball Makes Any Dinner Special Cookbook. Cook the rice in the water until tender, about 1 hour. Sauté the remaining ingredients in a skillet until the celery and onion are tender. Add the rice and stir to blend. Use in chicken roaster or double the recipe for turkey stuffing. For the Cornbread: Preheat oven to 400 degrees. Coat an 8-inch-square cake pan with cooking stray. In a medium bowl, combine egg whites, skim milk, and applesauce. Mix well. Combine the remainder of the dry ingredients and add to the skim milk and egg white mixture. Stir until blended and pour into a prepared pan; bake for 15 minutes or until bread in done. Remove from oven and cool. For the Stuffing: Spray a nonstick skillet with cooking spray and sauté celery and onion until tender. Add spices; remove and put into a large bowl. Add raisins, apples, and the cornbread, crumbled. Toss with the broth and sherry and bake covered in a casserole dish previously coated with cooking spray, about 12-15 minutes. If the stuffing appears to dry, add more broth. Toward the end of cooking, remove cover to brown. Substitute one cup of flour for one cup of cornmeal, if you prefer. 1. Soak the bread slices in a deep bowl of milk or water for 15 minutes. Lift them out by the handful and squeeze the liquid out. Tear the bread into small pieces. 2. Peel the potatoes, cover with salted water, bring to a boil and cook for about 20 minutes. Drain. Then add the butter, salt and hot milk, and whip to mashed consistency. 3. Melt the bacon grease in a large skillet, add the onion and celery, and sauté until soft. Stir in the squeezed bread, then combine with mashed potatoes. 4. Add eggs, celery, parsley and pepper. 5. Put mixture into buttered casserole dish. Cover with foil, and bake for 30 or 40 minutes in a 350-degree oven. Baste with turkey drippings, if desired. Put the prunes, currants, raisins, and apricot halves in a bowl and pour the bourbon over the fruit. Cover bowl and soak overnight. If you are using salted macadamia nuts and salted cashews, put them in a strainer and remove salt by rinsing them under cold water. Dry on paper towels. Heat 2 tbsp. vegetable oil in a skillet and add the nuts. Toast them, stirring constantly, until golden. Combine the apples, onions, and celery in a large skillet along with the butter. Cook the mixture over moderate heat, stirring occasionally, until the onions are soft and celery is tender, about 11 minutes. Transfer the onion mixture to a large mixing bowl. Add the macerated fruit and all remaining ingredients.